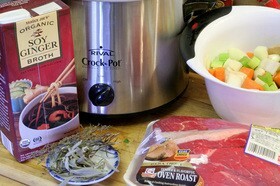 I use my crockpot all the time; not because it saves me money, but because it saves me time. I love being able to throw all the ingredients for a soup or a roast in my crockpot and then just turn it on and go write! I don’t always have time to cook — especially when I’m working on a deadline — so using my crockpot can be a super time saver for me. Another nice thing: using a crockpot preserves a lot more of the minerals and vitamins in vegetables when you cook them. So, crockpot cooking is healthier as well. Plus, while there are crockpot recipes that are less healthy than others (particularly the ones that use canned creamed soups and such), there are many crockpot recipes that offer low-fat alternatives. But the question of the day is: Does crockpot cooking save you money? It depends on where you live, and the kind of power you use for your home, believe it or not. For example, if you use gas to cook with, then cooking with a crockpot may not make much of a difference, since in many cases gas is quite inexpensive. However, if you use an electric oven, then a crockpot could save you quite a bit. If you use electricity to cook, and you live in an area where electricity rates are a bit better than some other parts of the country (like Seattle, where I live), it only costs $0.10 to run a crockpot for 8 hours. That’s no surprise considering that it only takes about 200 watts to run a crockpot. However, it takes approximately 2900 watts to run your electric oven. And you know that the more wattage your appliance uses the higher your electric bill is going to be. So, for people like myself who live in the Pacific Northwest, using a crockpot definitely does save us money. So, what if you live somewhere like the East Coast, for example, where electricity rates are very high? Will you still save money if you use a crockpot, as opposed to your electric oven? Let’s say for the sake of an example that where you live your electric company charges 8.2 cents per kWh and your electric oven uses 2900 watts, then it costs approximately 16 cents to run your oven for one hour. Since most people run their ovens for about 30 hours a month, then the power cost to run your oven for one month is only about $4.80. That’s not too bad, and that’s with a higher rate per kWh. Since most crockpots only use about 200 watts, then even at this higher rate you would only be spending about 2 cents per hour to run your crockpot. So, if you run your crockpot for 8 hours to cook a meal, then this is only going to cost you 16 cents per 8 hours. If you use your crockpot every day, then you come out at the same cost $4.80 per month to run your crockpot. Of course if you only use your crockpot half the time, then it will be half that. There are, of course, other factors to consider. 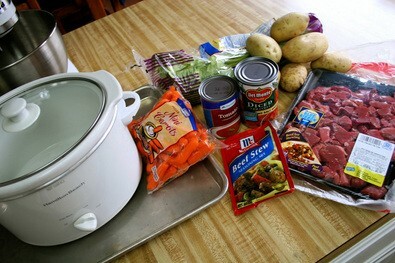 Maybe your crockpot meals only take 4 or 6 hours to cook, then the cost to run the crockpot monthly would go down. Or, maybe your electricity rates are lower. Or, maybe you use gas to cook and heat your home. These other factors can all play into the answer to the question of whether or not it is actually cheaper in terms of energy efficiency to use a crockpot vs a conventional oven. Crockpot vs Pressure Cooker: Which Is Better?